I use a Kindle but there is still something about holding a hard back book. I love books and it’s always the perfect gift in my opinion. 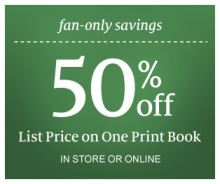 Head over to Facebook and “Like” Barnes & Noble so you can get a coupon for 50% off one book. This offer is good both online and in stores! Coupons Jan 23, 2010 in BarnesAndNoble, coffee, free, Starbucks · Expired!